Rationalist Dr. Narendra Dabholkar, on being offered police protection, had remarked, “If I have to take police protection in my own country from my own people, then there is something wrong with me. I'm fighting within the framework of the Indian Constitution, and it is not against anyone, but for everyone.” Five years ago, on August 20, 2013, Dr. Dabholkar was assassinated in Pune. Under the banner of Maharashtra Andhashraddha Nirmoolan Samiti (MANS), an organisation that Dr. Dabholkar founded and headed, he strived to instill scientific temperament and educate the people against the irrational superstitions. His fight to eradicate prevalent inhumane and irrational superstitious practices had earned him several enemies in his home state Maharashtra. Sanatan Sanstha (SS), a Hindu extremist group founded in 1999 by Jayant Balaji Athavale, a hypnotherapist, was pointed at by Dabholkar’s supporters, relatives, and now even the investigations are pointing at the involvement of the affiliates of the SS. 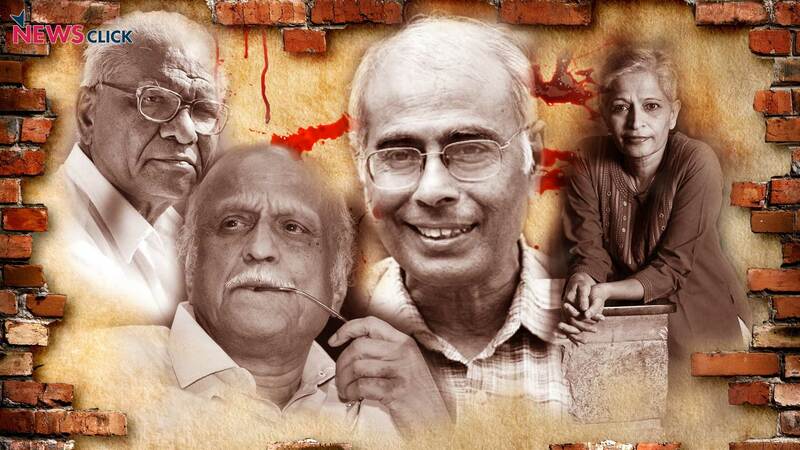 Two years after Dabholkar, rationalists Govind Pansare and M M Kalburgi, and in 2017 journalist Gauri Lankesh, were assassinated. The investigations have shown that the possibility of the same set of people having been involved in an attempt to silence the anti-Hindutva, rational and secular voices in the country through these assassinations is no longer a mere speculation. The Special Investigation Team (SIT) set to investigate the case of Gauri Lankesh has revealed a larger conspiracy of the extremist Hindu terror outfits functional in the country. The SIT has said that persons arrested so far in the case of Gauri Lankesh are affiliated to SS and its splinter Hindu Janajagruti Samiti (HJS). The revelations made by the SIT reports are chilling and has brought to light a full-fledged plan to kill all those who do not propagate the idea of a Hindu Rashtra. Central Bureau of Investigation (CBI), which is investigating the case of Dr. Dabholkar, still is far from arresting the assassin. The CBI arrested Sachin Prakashrao Andure of Aurangabad on August 18, 2018, alleging that he was among those who shot Dabholkar. Andure is the fourth person to be arrested in the case. On June 20, 2014 Manish Nagori and Vilas Khandewal were arrested by Pune police. Following a PIL filed by journalist Ketan Tirodkar, the CBI had taken over this case in May 2014 on the directions of the Bombay High Court. In May 2016, Virendra Tawde of SS was arrested in connection with the case. Along with Tawde, the CBI has named Vinay Pawar, who is missing since 2009, Sarang Akolkar, who is absconding in the October 2009 Goa blast case, as prime suspects. The CBI also suspects that Andure hatched the murder conspiracy with Tawde. While the investigations in the murders of Dabholkar, Pansare and Kalburgi have not yet nailed the culprits, the SIT investigating the murder of Gauri Lankesh, has been successful in tracking down her assassin, and his confessions have confirmed what the gun indicated and has unveiled a larger conspiracy. The conspiracy and its scale began to unravel last year when a Forensic Science Lab report revealed that the same gun was used to kill Kalburgi, Pansare and Lankesh. The three murders occurred at different places, and were months apart. It cannot be a coincidence that the same murder weapon was used everywhere. Parashuram Waghmare was arrested on June 12, 2018, and was produced before the 3rdAdditional Chief Metropolitan Magistrate (ACMM) Court. He has confessed to have assassinated the Gauri Lankesh to “save Hinduism”. The SIT had earlier arrested five people– K.T. Naveen Kumar alias Hotte Manja, Amol Kale, Manohar Edve, Sujeeth Kumar alias Praveen and Amit Degvekar. The confessions of Waghmare brought already arrested Amol Kale into light. During the course of its investigation, the SIT has recovered two lists containing names of 34 targeted individuals who had publicly condemned Hindutva politics. The list recovered from Amol Kale had eight names. Girish Karnad, a well-known playwright and activist from Karnataka was the first name, followed by Gauri Lankesh. The second list had 26 other names. While interrogating Ganesh Miskin – a member of Hindu extremist group Sri Rama Sena, who was arrested in July on the suspicion of being the person who rode the motorcycle pillion with Waghmare – the SIT has reportedly learnt that his recruiter, Amol Kale – the former convener of HJS – is the killer of Kannada scholar and rationalist, M. M. Kalburgi. As per a Kannada newsreport, Miskin has revealed that it was Kale who shot dead Kalburgi at the doorstep of his house three years ago. SIT has also reportedly learnt that Kale was ordered to carry out Kalburgi's assassination by a person named 'Kaka' alias Shankar Narayan, who has died six months ago. It was Narayan’s right hand man – associated with one of the Hindutva outfits in Maharashtra such as Sanathan Sanstha or HJS – who drew the plans for Gauri Lankesh’s assassination. Also read: Latest: Is the Shooter Who Killed Kalburgi Arrested Already? Based on the information given by the SIT, Anti-Terrorism Squad (ATS) of Maharashtra raided the house of Vaibhav Raut on August 10, 2018, an SS sympathiser and a member of Hindu Govansh Raksha Samiti, and recovered at least eight country-made bombs, along with other explosives and literature of the SS. Confessions of recently arrested Rajesh Bangera in the case of Lankesh shows that the investigations in all the four cases must be carried out together, and not independently. Bangera has confessed to have trained Rudra Patil, Akolkar, Pawar, Tawade in using arms. He has further informed the SIT that he had joined a Maharashtra-based organisation in 1997, and its chief had made it compulsory for its members to learn to use arms. Even though he left the organisation in 2009, he stayed in touch with the organisation and that is how he was approached by Amol Kale. Kale and Amit Degwekar had approached him in 2011 to train a few young boys. Bangera’s confession yet again highlights the need to investigate all the four cases together. The SIT investigation reports in the case of Gauri Lankesh are revealing the fact that all the accused and arrested so far are connected in some way or the other.